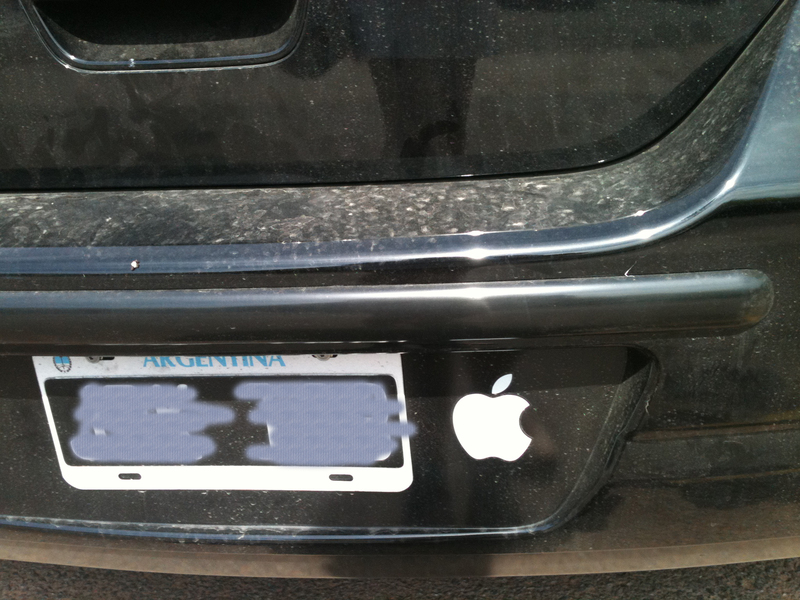 Although it seems very strange to me, here it is very common to put an Apple sticker on your car. You know, the sticker that you get together with your iPod or Iphone. I have always wondered what they were for. In Argentina they found the answer. They put them on their car. Is this some kind of status symbol? An iPhone or Ipod costs about 2 or even 3 times as much as in the States, and I am quite convinced that many of the sticker-owners got theirs directly (personally or via a friend of acquaintance) from the States. It really is a luxury item, a must-have for the well off. This is strange. After all, due to safety reasons, it is better not to stand out by driving a fancy car, nor is it advisable to use a fancy cellphone while walking on the street. So why one would like to show via this sticker on their car that they actually own such a luxury device (and probably even have it on them) is a complete mystery to me. This said, the other day I came across this other guy. 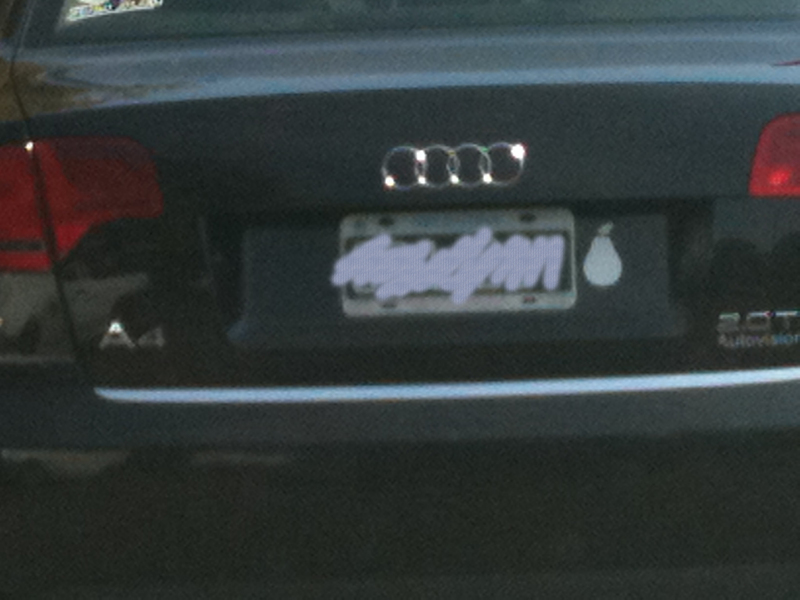 Was he making fun of the Apple-cars, or am I just behind on progress, and is this another, yet more luxurious brand? I had heard that the friends of my kids say that my kids speak Spanish “monotonously”. Hmm, that comes as no surprise if you know what Argentine Spanish sounds like. “(1) I walked passed a girl yesterday or the day before and her arm NOT CONNECTED to the hand holding her cell phone was moving about twice as fast as her lips were. And she was talking quickly. (2) Stretch the ever-living-crap out of the second-to-the-last vowel sound in every 3rd or 4th word. (3) And, for no reason what-so-ever, just a little less frequently send your voice up about 3 octaves until your voice cracks. Do this over and over and over even though there is absolutely no reason what-so-ever to emphasize these words/syllables. And if it ends up that that part of the word is absolutely unintelligible? No p^sa naaaaaaaaaaada, porque ^toy todo tranquiiiiiiiiiiiiiiiiiiiilo. (4) Oh, and drop your “S”s all the time. The more street you want to sound, the better. And then claim that you ARE pronouncing your “S”s, but that it’s simply a soft S.
(6) Before you say something, make kind of a <tsk> sound by sucking air into your mouth as you separate your tongue from the top of your mouth right behind your upper front teeth. (7) Start most of your statements with a negative sound. “Nooooo, no, no…” or “Naaaahh, naaa…” or “Para, para, para…” Start with something negative even if you are going to give an affirmative answer. (8) Kiss every living thing within 10 feet of you on the right cheek before you even say a single negative thing. (9) Shrug the hell out of your shoulders and tilt your head to the side often as you talk, because this will affect your speech in a way that I can’t explain. (10) Touch people with your hands as you are talking to them. Touch their arm, their shoulders, and if you’re sitting, you can even put your hand on their thigh. The lack of awareness of personal space will be detectable in your speech pattern. (11) Throw in some “Y, y, y…. nada.”s and a few “Viste?”s when they least expect it. Use “dale” for “ok?” or “let’s go” and really try to use a “che” soon after it so they don’t think that you’re just some poser. I cut it a little short, but you get the point. DO NOT HANG UP QUICKLY OR YOU WILL BE DEEMED AS HAVING MALAAAAA UNDAAAAAAAAAAA!!! And you’ll probably never be invited to another asado again if you’re deemed to be in proud ownership of mala unda. (13) If you’re a 13-15 year old girl, shuffle your beaten up Chuck Taylor All-Stars (or imitation) canvas high-tops, as you play with (one of) your (pieces of facial metal) [CHOOSE ONE: lip pierce; tongue pierce; push-pin-jabbed into your face a centimeter above or below your actual lip] while saying “boluda” like you just learned the word 9 days ago and it’s your new favorite word FOREVER!! !… “PFPS”… Palabra Favorita Para Siempre. Once you’ve mastered all of this, come back and I’ll give you some more tips on how to sound autentico. How about the Argentine ice cream? Some people put “ice cream” in their top 5 of things they like in Argentina. I never did. I had only eaten Freddo once in a while, and really, I didn’t think it was worth putting on wheight for. So why Freddo? Why not Volta or Persicco? Well I must admit, because I was told Freddo was the best and because I never tried the others. That is, until this weekend. Not only was Volta super-delicious, they also had my favourite flavour, “mokka” of coffee. Unfortunately there is a Volta close to my house, and with the summer coming, it will be hard for me to pass by without buying a delicous cone. So I guess that now ‘the battle’ has begon. Which is the best ice cream? Which ice cream do you like the most? Is it Freddo, Volta or Persicco ? I have yet to try the last brand (there does not seem to be any close to my house) but meanwhile, you can start voting ! 200 years ago, Fryderyk Chopin was born in Poland, as the son of a Polish mother and a French inmigrant. He was virtuoso pianist and composer, and one of the greatest masters in Romantic music. The Fundacion Chopiniana organises a piano festival in Palacio Paz. A total of 9 concerts are given by 9 different pianists of different countries, they all play something by Chopin, and (depending on the program) works by Brahms, Liszt, Mozart and others. Palacio Paz used to be a –gigantic- private house, and the concerts are given in the ‘small’ concert hall. It is really a very nice place to listen to a piano concert like this. For all Piano lovers in Buenos Aires is it something not to be missed. 3th of nov Konstantin Scherbakov (Russian) plays Scarlatti, Haydn, Bach, Busoni, Tchaikovsky, Wagner, Verdi, Gounod and Liszt. The tickets can be bought in the Palacio Paz (Santa Fe 750) every day between 1pm and 7pm and range between 100$ and 60$. In 2008 a new museum opened its doors in Puerto Madero. It is called “coleccion de arte Amalia Lacroze de Fortabat”. Also known as Amalita Fortabat, she is considered to be the ‘richest woman in Argentina’, and one of the most successful businesswoman of the country. She is also a very important art collector. Amalia, who was born in 1921, married Alfredo Fortabat, who was 27 years her senior, in 1947. After 30 years of marriage her husband died at the age of 81. She took over his companies, lands and farms and livestock, and inherited one of the largest fortunes of Argentina, which she managed to increase considerably. In 1976 she started up a foundation (the Amalia lacroze de Fortabat Foundation) that promotes and stimulates all kinds of initiatives; cultural, artistic, charitable and many others : as long as it affects the public good. 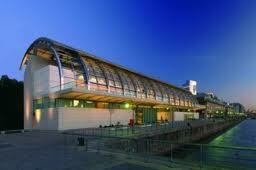 In 1998 they started with the construction of the museum designed by the architect Rafael Viñoly. The construction is made of concrete, steel and glass. It has a splendid view over Puerto Madero, and the glass roof can be covered with an ingenious system that changes position depending on the position of the sun. It was her wish to be able to see the stars when looking at her paintings. Over 230 works of the personal collection of Amalia are displayed, including works of Alejandro Xul Solar, Antonio Quiros, Jorge de la Vega, but also, Breughel, Rodin, Vermeer and Warhol. The masterpiece is without any doubt the one of Venice (called Julette and her nurse), painted by Turner. Amalia made it to international news when she paid 7 million dollars for it. It used to hang above the fireplace in her triplex in Libertador. The collection is very divers, and definitely worth a visit. So is the building itself. You should also include a lunch in the restaurant, as the food is delicious. Colleccion de arte Amalia Lacroze de Fortabat, Olga Cossettini 141, Puerto Madero Este, (dique 4). Open Tuesday through Sundays from 12 am to 9 pm. entrance $15. Why on earth am I still in Argentina, one year later? This is not just my first year in Argentina, this is also my first year living in another country than my home country. In fact I have always lived within a radius of 15 km to the place where I was born. So yes, moving here was something. It was not as if we didn’t know the place before taking the big step. We had been coming here several times a year, so it already felt like home even before it was our home. Before, when we would come here on holiday, as soon as we returned home, we were already thinking about when we’d be able to come back here. But then, we thought, coming here on holidays (or –for my husband- for work) is not quite the same as moving here. But it all went smoothly. It is not as if we moved to the other side of the world, I always say, although it is the other side of the world; but with internet there is no such a thing as long distances. I am still as happy about being here as I was a year ago, and I don’t regret moving here for one single moment. I still absolutely love the city, I enjoy the city life. Everything close, shops open till late, crowded streets, people speaking Spanish in a melodious way that makes it sound like Italian if you aren’t really listening, I love it all, and the weather! I had real problems with the Belgian-constant-grey-gloomy-weather. Here, if it is grey and gloomy, it won’t last longer then…a week, but mostly it only rains one or 2 days. I love the heat in summer, and the winter, is nice, cold and, short! Kids being picked up and brought back to our door (there, I had to bring them to the station at 7 am and pick them up again at 5pm). The way friends and others help each other with everything. Call them whenever you need them, even during work. They will let you know if they ‘can’t talk’ if not, they call you back asap! Here people work to live where as in Belgium, they live to work. Spend quality time with family. Dinners, Sunday asados, can last forever. Living in the city : exhibitions, museums, concerts, restaurants. If I ever go back, I will probably move to a city. Driving around in the city. A bit aggressive but still without stress. And last but not least : the weather!! Not being able to carry my camera around all the time (safety reasons). As you can see the balance is still positive, so we are ready to start our 2nd year here!! Did you guys here in Argentina, notice the weather? I am sure you have : for the 3th day in a row is is grey/cold/drizzling-with-every-now-and-then-a-downpoor. It is supposed to last for another 2 or 3 days. I have taken out my Damart again, my boots and wintercoat. And my umbrella of course, although I try not to go out. This is the weather we (correction, they, as we are now living in Argentina) are used to having in Belgium most of the time. It is the weather they have been having during the whole month of august. That’s the summer season -when people rent appartments at the beach-. Then they ask me Why on earth did you move to Argentina? Do I really have to answer this???? I can’t even seem make it through this 1 week without going crasy…How did I survive this when living there???? I love Argentina, even the unpredictable, unstable, now hot then cold, spring. We had read in some magazine, that Club Francés has been restored and renewed, and that the restaurant is supposed to be good. The combination of ‘French’ and ‘good restaurant’ made it a must for us to try. After all, Belgian cuisine is, apart from a few regional dishes, the same as French. Full of enthusiasm I called the restaurant to make a reservation, in French, and the man at the reception answered me with the dry “Que dice?”. Club Francés, the place where people come together to speak French. It was found in 1866 by French residents, they used to gather in the legendary café Malakoff : it’s only in 1941 that they bought the current building in Rodriguez Peña. Over the years they have had many ‘important’ visitors, like President Peligrini, President Figueroa Alcorte, Georges Clemenceau, the duke of Windsor (later Eduard VIII), Jorge Luis Borges, the Belgian prime minister Paul Van den Boeynants (more known because he was kidnapped and involved into different scandals then through his visit to Argentina) and many others. Now, in 2010, we didn’t hear a word of French. The waiters didn’t speak French. Although the people were all speaking Spanish, according to their looks, they could have been… Belgians. (Now I won’t tell you if this is good or bad). It looked like the entrance hall was indeed renewed, cleaned up, or has had a facelift, but the restaurant definitely didn’t. It looked old and worn out, with chairs and tablecloths that didn’t fit into the interior. It was tasteless. It did not look French. The menu looked good, and I was immediately tempted by the ‘rack of lamb’, wondering if it would really be prepared in the way I am used to, the ‘French’ way. It certainly looked like it, but it was more like a sheep then a lamb, and it was certainly no “milk lamb” as we are used to. It has probably been grazing on the endless fields in Patagonia for ages, and developed good strong muscles, and fat, before ending up on my plate. This is the short story of our encounter with “el Club Francés”, in Rodrigues Peña, Buenos Aires…. It looks like I am only just starting to get to know the Buenos Aires cultural night life. I went to this rather small but nice theatro Avenida (on avenida de Mayo), to see another Opera. This time it was Mozart’s Cosi fan Tutte. The Royal Conservatorium of The Hague has a cooperation agreement with the Universidad Católica Argentina, in order to organise academical activities together. This performance was one of them. The story is quite funny, 2 friends (Guglielmo and Ferrando) made a bet with another friend (Don Alonso) about the fidelity of their girls. The 2 young men acted as if they were leaving town, but they came back dressed up as Albanians, and tried to seduce their girlfriends…. I just love this opera! This performance was really good, especially the women had incredibly good voices. The costumes were really beautiful, and looked like the clothes they wore at the end of the 18th century. The instruments were the original ones, including the harpsichord, which is, in my opinion the ideal background instrument for telling a tale. If only we hadn’t been sitting ‘in paradise’ -which is all but paradise, I can assure you that– it would have been perfect. 4 Hours sitting on a small wooden bench, having to bend over to see well, makes you wish you had some fat on your behind… I would love to see it again, but then I would certainly pay a bit more! I am sure it is a coincidence : good weather phenomenons are called after male saints and bad weather phenomenons are called after female saints. After the Veranito de San Juan, it looks like we are now getting the Tormentas de Santa Rosa. After the first spring-like days at the end of august, beginning of september, come the thunderstorms. Named after the saint Santa Rosa de Lima. The legend says that in 1615, the city of Lima feared an attack by Dutch pirates, and a nun called Sister Rosa (real name Isabel Flores de Oliva) prayed for salvation, and just when the Dutch were about to arrive, a heavy storm prevented them from attacking the city…. Eventhough it as been a while since the Dutch (or others) tried to attack ‘us’, the thunderstorms always come around this period, as it is now that the first warm winds bring an air of spring to the southern hemisphere, and they are always followed by thunderstorms. Some say these storms are the worst storms of the year, but statistics don’t confirm this. We have just had (and are still having) these first warm winds together with our first days of spring weather. Let’s just wait and see what Santa Rosa has in store this year.